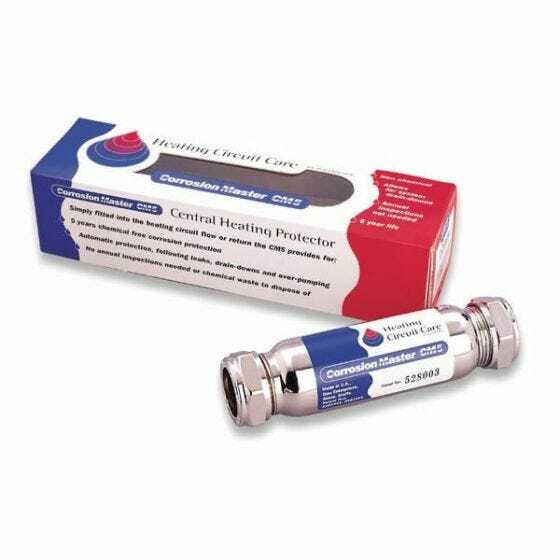 The Scalemaster® Corrosion Master provides a non-chemical method of protecting central the heating system primary circuit against corrosion and limescale precipitation. The Scalemaster® Corrosion Master provides a non-chemical method of protecting central the heating system primary circuit against corrosion and limescale precipitation. The Corrosion Master contains a sacrificial zinc anode wrapped in copper mesh which removes dissolved oxygen from the re-circulating heating system water by converting it to a harmless hydroxide species which does not support the corrosion process. Zinc is simultaneously released from the anode providing cathodic protection throughout the system and forming a complex with the dissolved calcium ions making it harder for the dissolved hardness salts to precipitate as limescale. Once fitted, the Corrosion Master automatically responds to any increase in dissolved oxygen when fresh water is introduced and thus provides ongoing protection against corrosion even after drain-downs.